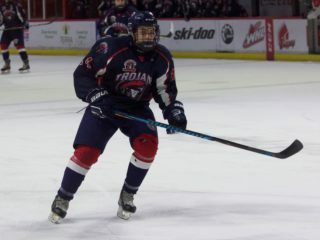 (Marc Smith/DiscoverMooseJaw) The Moose Jaw Warriors will be losing a lot of high-end talent again from this season’s team, but the future continues to look bright for the local WHL squad. The likes of Justin Almeida, Josh Brook and Tristin Langan will be moving on after this season, but Brayden Tracey and Daemon Hunt are ready to take on the lead with the Warriors. Both players played big roles on this season’s team and that will grow heading into next season. Tracey had one of the best rookie seasons in Warriors’ history as he finished with 36 goals and 81 points in 66 games, leading the entire Canadian Hockey League in rookie scoring. The 17-year-old was able to hit the ground running with the Warriors after being sent back to Midget ‘AAA’ as a 16-year-old. “We have a great coaching staff, they helped me a lot and the team behind me too, especially my linemates throughout the year, it’s been a blast,” said Tracey, who will be up for the WHL Rookie of Year award next month. Tracey moved onto the Warriors’ top line with Almeida and Langan early in the season and the trio clicked. Tracey said that he learned a lot from playing with those two veterans. “Compete level was one of the biggest, never give up, always keep pushing and things will come to you, and for our line, we were a pretty high-end line and it was pretty fun,” said Tracey. Like Tracey, Hunt stepped right into a big role with the Warriors during his rookie campaign. The 16-year-old played top-four minutes with the Warriors’ defencemen right from the start of the season. He said he was able to take a lot away from this season that will help him moving forward, “All the older guys, they supported me and helped me, I’m really happy with my game and how far I’ve come as a player,” said Hunt. 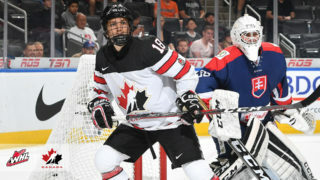 Hunt posted seven goals and 21 points in 57 games as a 16-year-old defenceman. He was also plus-21 for the season. Heading into the offseason, Hunt is focused on improving his game to come back stronger for the Warriors next season. “I want to improve in all areas, but the biggest thing for me is definitely skating, the game is getting faster and faster, so if I’m able to work on my skating, power stride and quicker starts than I can really step up my game,” said Hunt. The Warriors could lose 106 of the team’s 234 goals this season heading into the 2019-20 season, but with a large number of players set to return, both Tracey and Hunt are excited about what lies ahead for the team. “We’re a special team, we did some pretty cool things this year, we set records, that’s pretty good for a young squad like this, and we’ll be right back here next year and we’re going to push for it,” said Tracey. 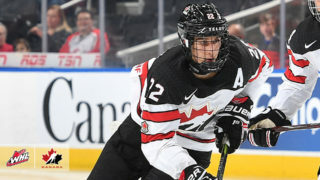 Before Tracey worries about next season, his attention will be on preparing for the 2019 NHL Draft. 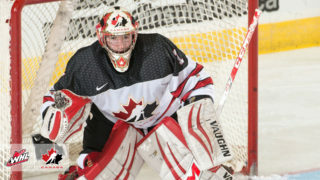 He was the 73rd ranked North American skater in NHL Central Scouting’s midterm rankings. Tracey said he hasn’t been worrying much about the draft yet, “It’s in the back of my head but I try not to look at it too much, I don’t want to stress about it, but when the time comes, hopefully, my name gets called and it will be a lifetime experience,” he said. The NHL Draft will be held in June.